When starting this blog just over a year ago, I was not entirely sure what I would write about. My only idea was to do pieces on anything which came to mind and see how I progressed. As anyone who has been following me for the last few months will observe, my main interest lies in images. Gear, while obviously essential to photography, does not really interest me for its own sake. Writing about my photographs allows me to document my approach and technique where appropriate. Most of my posts have been part of my “Photo of the Day” series, where I have showcased recent images which I feel have some appeal. Admittedly there has been some gear talk, but that has dropped off since the early days. The least interesting thing about an image is the camera used to take it. Sometimes it is important, which is when I include relevant technical details in addition to aesthetic considerations. I also have a number of images taken before I commenced blogging, so I am introducing a new occasional series – “Photo Retrospective”. I am starting with one of my more unusual images, “The Street”. 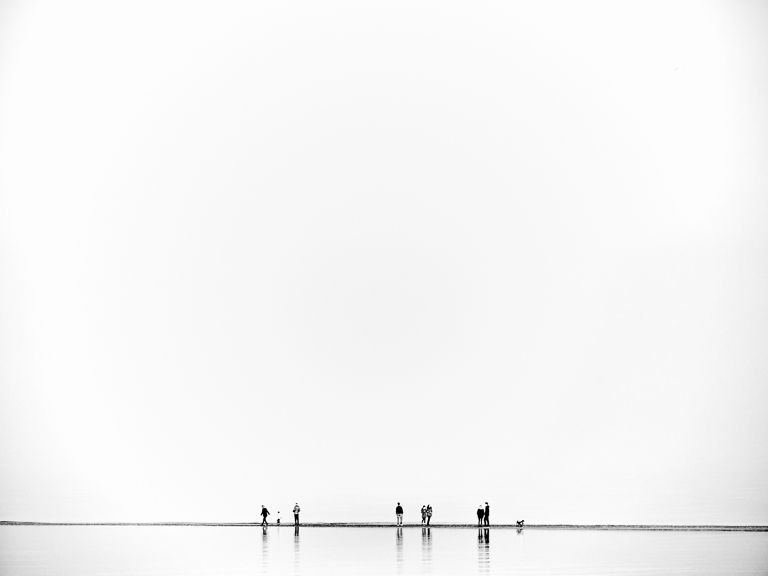 Despite appearances, it is a straight shot which I took at Whitstable in Kent. 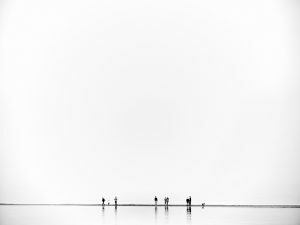 It features people walking on a sandbar which runs out to sea and is exposed at low tide. On this day, there was a mist over the sea which isolated the figures from the background. Only the water in front of the sandbar is visible. I am unsure how frequently those particular atmospheric conditions occur in the area. Certainly, I have not seen anything similar on the few occasions when I have returned to the area. This is an instance where it is appropriate to provide some information about the camera which I used. It was an Olympus OM-D E-M10 with a Panasonic 45-200 lens, set at 184 mm. That is equivalent to 368 mm on full frame. It is an inexpensive lens which cost less than £200 a few years ago when there was a cashback promotion. DxOMark does not particularly rate it, giving it a score of just 13. That is at the low end of its scale, just above what DxOMark considers to be poor. Against that, it is light for such a long lens and is easy to carry. Purely on the basis that I am more likely to have it with me, I have made a number of successful images with this lens when opportunities have arisen. Yes, pixel peeping the figures shows that they could benefit from a bit of extra resolution, but they are so small in the frame it does not matter. There is sufficient definition for an A3 print. The low cost of the lens was more of an issue due to some strong vignetting which the pale background emphasised. It was less obvious on the screen but took some time to eliminate when I made the print. I had four attempts before I had one with which I was happy. I needed a long focal length as the figures were quite a distance away. It was possible to move closer, but the geography of the area made that awkward. It would have meant shooting at an angle and did not make for such a good shot. Some might consider the composition to be controversial as it relies on negative space. Indeed, it is nearly all negative space. Some might prefer cropping the sky to create a panorama, but I feel that by doing so it would lose its effect. So far, the judges have agreed with me in the two competitions to which I have submitted the image. This post is part of my occasional “Photo Retrospective” series for images which I took before I commenced writing this blog. They are shots which I consider to be of interest and for which I can tell the story behind them.